Would you recommend Pablo by Buffer to a friend? @joelgascoigne Been looking for something like this, glad Buffer solved it :) One suggestion/idea in terms of UX: give more CTA to the upload image button since I was searching for a way to upload a image and I confused the upload icon as a image himself. Keep shipping! @brian_lovin @patrikward @sahir_memon @kevanlee @leowid @joelgascoigne Nicely done. I've tinkered with variations on this several times. Simple, but useful. I've been waiting for the Buffer team to release something like this. It's a good MVP and I'm looking forward to seeing how this is incorporated into the Buffer Chrome extension (a one-click option would be nice). While these artistic image + text photos are beautiful, in most situations I'd prefer to use a hero image pulled from the site I'm sharing or a screenshot of the page itself, similar to this tweet of mine. Is this something you're considering, @joelgascoigne? This reminds me a lot of http://www.tryspruce.com/, have been using it a lot lately. Nice to see that buffer has something similar now! @knoddecee @brian_lovin Love seeing Spruce as an inspiration! Look forward to see you guys expand on helping creating and share better content online. Which is the best designing tool according to you? 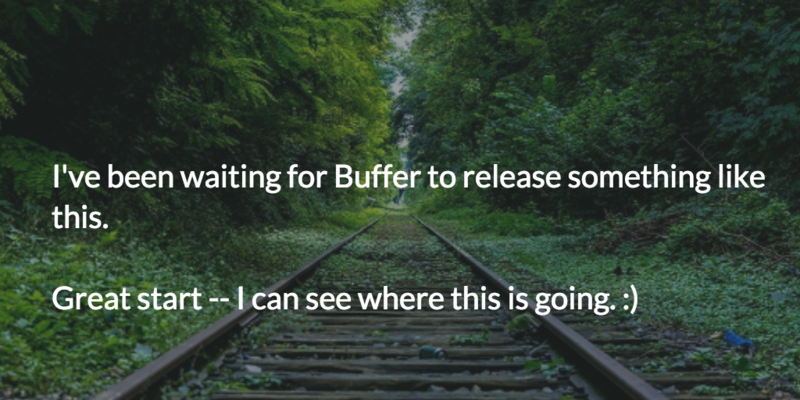 Get Buffer on Product Hunt.